The first time there is a successful run on HQ each turn, you and the Runner secretly spend 0credit, 1credit, or 2credit. Reveal spent credits. If you and the Runner spent a different number of credits, you choose which cards the Runner accesses from HQ for the remainder of this run. 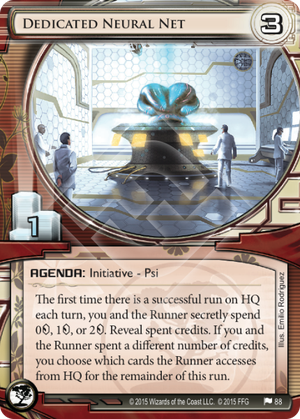 If the Runner plays Legwork while Dedicated Neural Net is scored and loses the Psi game, does the Corp choose the cards the Runner will access one at a time, or does the Corp choose a set of cards and the Runner accesses them in any order? The Corp chooses a set of cards for the runner to access of size equal to the number of cards the Runner will access from HQ, then the Runner accesses them one at a time in the order of the Runner’s choosing. If the Corp has scored Dedicated Neural Net and wins the Psi game, what happens when an Information Sifting run is successful? Dedicated Neural Net has no effect on Information Sifting runs. The Corp will create 2 piles, the Runner will choose one of the piles, then the Runner will access all cards in the pile in the order of their choosing. As a general rule, 3/1s are the runts of the Agenda litter. They have the absolute worst investment-payoff ratio (excluding 2/0 agendas), and their ability to be rushed or scored through never-advance is insignificant compared to the 3/2 agendas' payoff when scored in the same manner. Therefore, whilst a 3/2 can be played on stats alone, a 3/1 has to have a pretty powerful ability. I feel like Jinteki actually run more 3/1s than any other faction; House of Knives and Chronos Project are not uncommon, and I see False Lead and Profiteering on occasion. 1) Is the ability any good? 2) Is the ability good enough to force its way into any decks? To address the first one; yes, absolutely. As anyone who has faced Caprice or Marcus can testify, Psi games are freaking annoying when paired with hard consequences. Dedicated Neural Net isn't as powerful as either of those two, but once scored it is almost impossible to remove. -Controlling accesses is a big thing, even if you don't have a 100% chance of pulling it off. In Jinteki especially, it isn't just agenda protection, it's also trap activation, and can be a powerful information denying tool. Don't want them to know you've got Scorched Earth? Don't let them see it! -It also adds another layer of Psi to the possible HQ defences. Imagine a Runner going for HQ and having to defeat Caprice and work through the Neural Net, just to access The Future Perfect? That's a 3.7% chance of them getting that agenda. -Being a 3, it's not too hard to score. -They can stack. Each one is another psi game the runner has to win. -Only one Agenda point! The goal is, after all, to get to 7, and these are the slowest way to do so. If you're going for a flatline, House of Knives surely takes its place. -Only once per turn ability, and only on one server. -Does not affect cards which replace the accesses, such as Account Siphon or Information Sifting. The second point, whether it's worth putting in decks, is difficult to answer. If you weren't running 3/1s before this card isn't going to force its way in, just because of its nature as a 3/1. But if you were playing 3/1s anyway, I would strongly recommend giving this a go, even just as a 1-of. It isn't a replacement for a good HQ defence, but it is an extra layer of hassle that the runner has to keep dealing with.